This might sound like an odd combination of flavors for those new to this dish, but trust me, this one really works and is a great accompaniment to steak or chicken dishes. 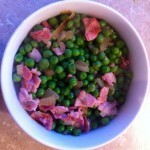 Use fresh peas during June/July or frozen peas the rest of the year round, both taste equally as good. I personally prefer unsmoked bacon in this dish as smoked bacon made the dish a little too salty.